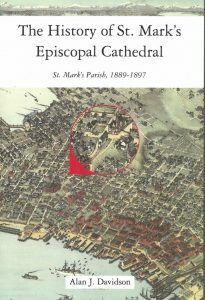 The story of the founding of Saint Mark's Parish in Seattle and its earliest years may be read in the recently-published book The History of Saint Mark's Episcopal Cathedral: Saint Mark's Parish 1889–1897, by Alan J. Davidson. Please follow this link for more information, and how to purchase the book. 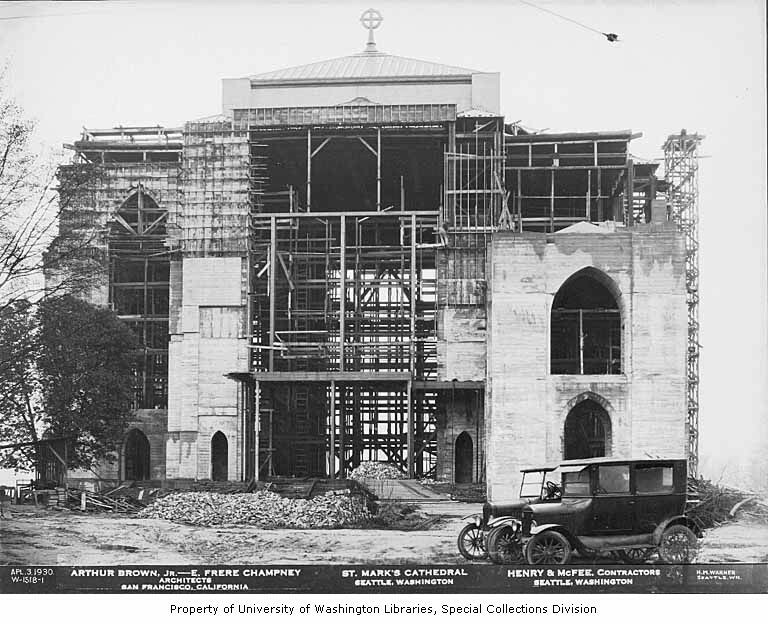 Saint Mark’s was founded in 1889 to meet the needs of a growing Seattle population. 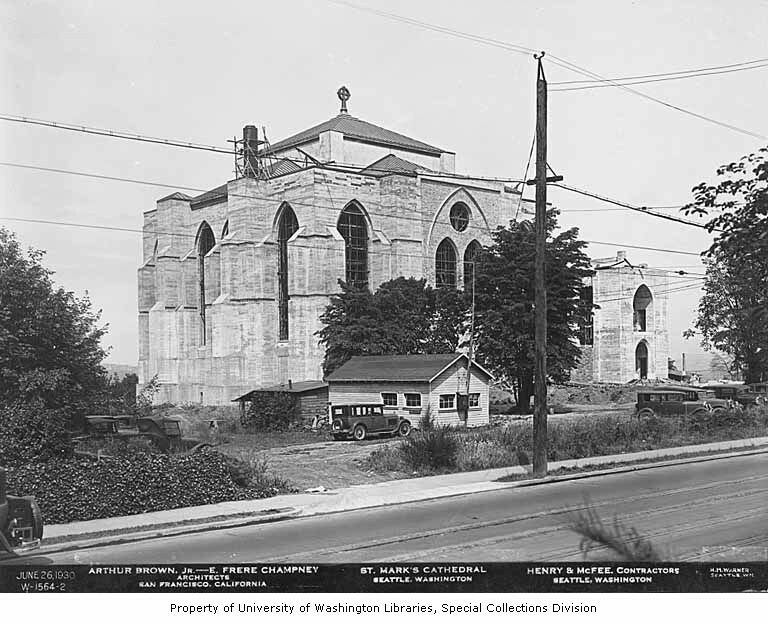 The first church was built in 1890 at 5th Avenue and Stewart Street, in downtown Seattle. 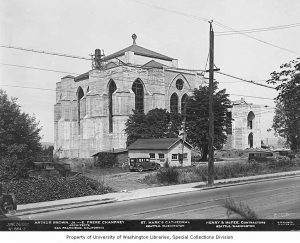 By 1896, the parish had outgrown this small church and in 1897 moved into a larger building at Seneca and Broadway on First Hill. 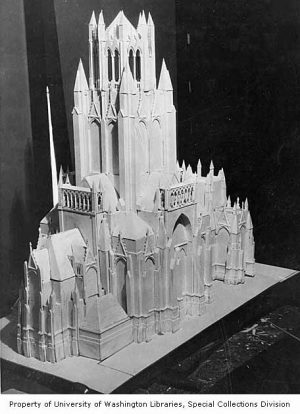 After World War One, growing diocese support led to a “Victory Cathedral”, and land was purchased in 1923 on Tenth Avenue East. In 1926, Saint Mark’s was designated to be the Cathedral of this Diocese, and Rector John McLauchlan became the first Dean. A magnificent building was envisioned, plans were drawn up, pledges made, and in 1928 construction began. The Stock Market Crash of 1929 and the depression that followed resulted in a considerable decrease in funds. The building that we sit in today (called by some a“Holy Box”) represents what could be done with the money that was available. Saint Mark’s Cathedral was dedicated on Saturday, April 25, 1931 in a service that took place in Thomsen Chapel, the only space finished in the style meant for the whole Cathedral building. The Parish could not maintain its mortgage payments, and in 1941 the St. Louis bank foreclosed. The “For Sale” sign on the front lawn made national news. Remaining Parish members worshipped in St. Barnabas Church nearby on Federal Avenue E (now a private residence). But the church didn't stay unoccupied for long. In 1943, the U.S. Army leased the building to use as an anti-aircraft gun training center; a series of murals still decorate the crypt walls, which was used as the soldiers' canteen. In 1944, Bishop Huston went to St. Louis to negotiate with the bank, and Saint Mark’s opened for worship later that year. Between 1944 and 1947, increased fundraising boosted support, the St. Louis bank forgave the last $5,000 of the debt. 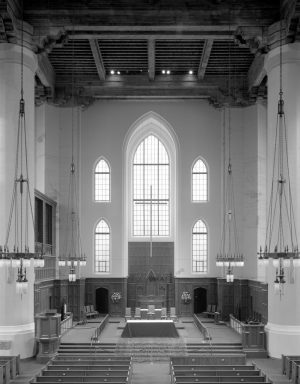 On Palm Sunday in 1947, the mortgage was burned in front of the Altar. 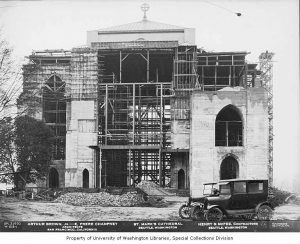 In 1958, Cathedral House was constructed at the west end of the building, an addition containing Bloedel Hall, the kitchen, Library, Parish Office, classrooms and other meeting rooms. In 1961, organist and choirmaster Peter Hallock went organ shopping, as the old weather-beaten 1897 organ was being held together by faith and baling wire. 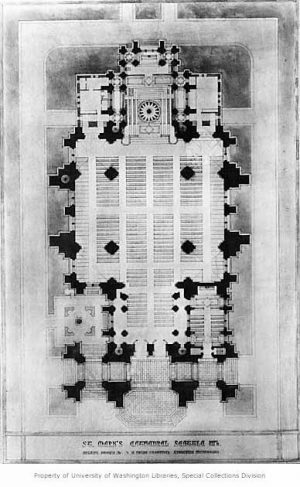 Peter selected Holland's Flentrop Company to build Saint Mark's next organ. 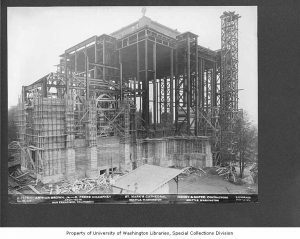 D. A. Flentrop visited Seattle and proposed the largest instrument he had yet designed. 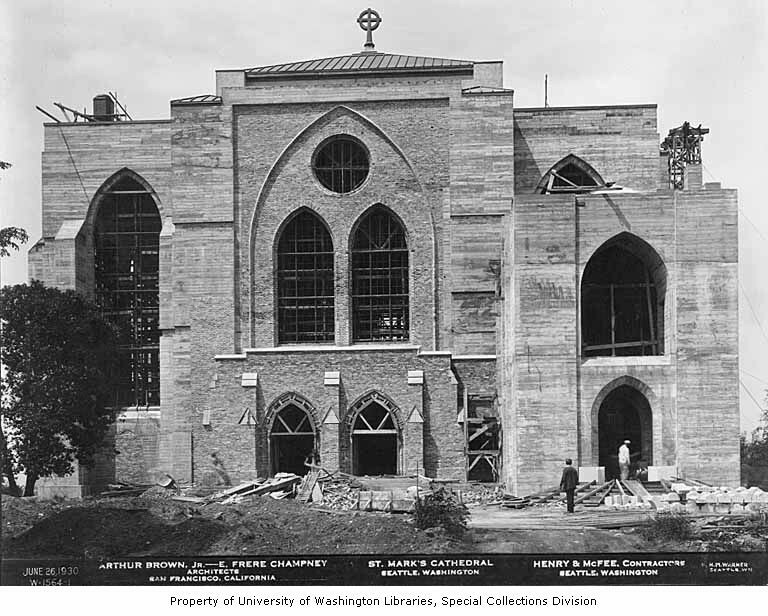 In the summer of 1964 demolition of the East Wall began and the Narthex/Loft constructed to make room for the organ. 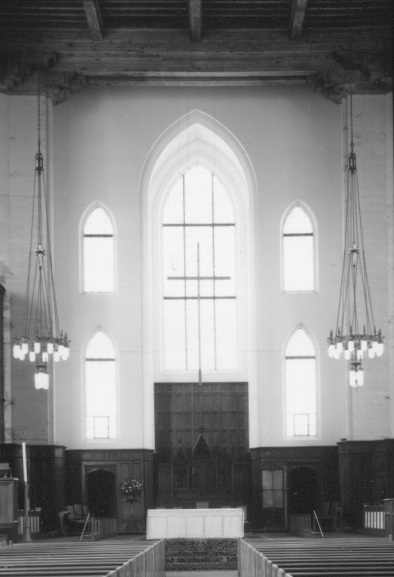 The organ was dedicated in September 1965 with E. Power Biggs playing the inaugural recital. 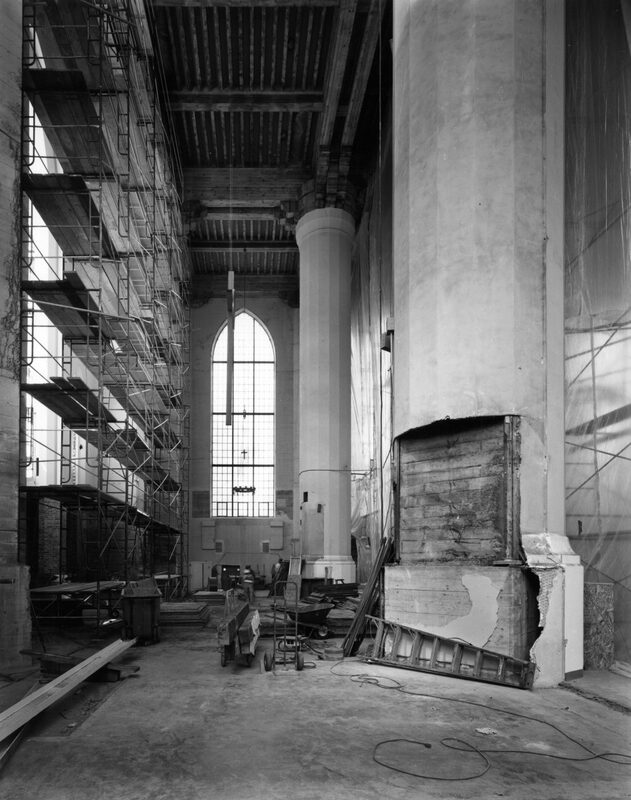 In 1969, the Chapel of the Resurrection and Columbarium was built under the Nave connecting with Cathedral House. 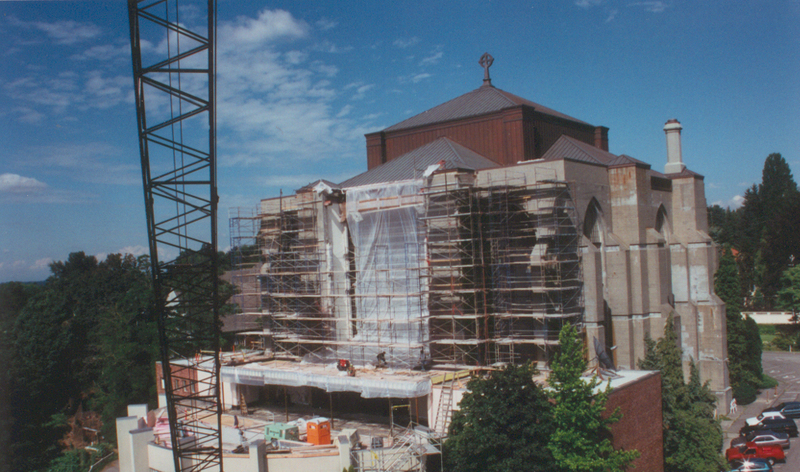 In 1997, the West Wall was remodeled and new sacristies and vesting rooms were built. A dark and constricted altar area (sanctuary) became the light and open space we now enjoy. The design by Olson Sundberg Architects is enhanced by northwest artist Ed Carpenter's glass and steel screen. This forms the backdrop (reredos) for the Altar Table, the focus of our worship. In the center of the screen under the rose window are two great doors, which can be opened or closed for different occasions or seasons of the church year. Behind the screen is McCaw Chapel, an intimate space for private prayer, where the Blessed Sacrament is reserved. In 2003, Saint Mark’s acquired the St. Nicholas School Building next door for future expansion of the office, classroom, meeting and worship spaces. That year also saw the gift of a fine new organ for Thomsen Chapel built by Paul Fritts of Tacoma, WA.